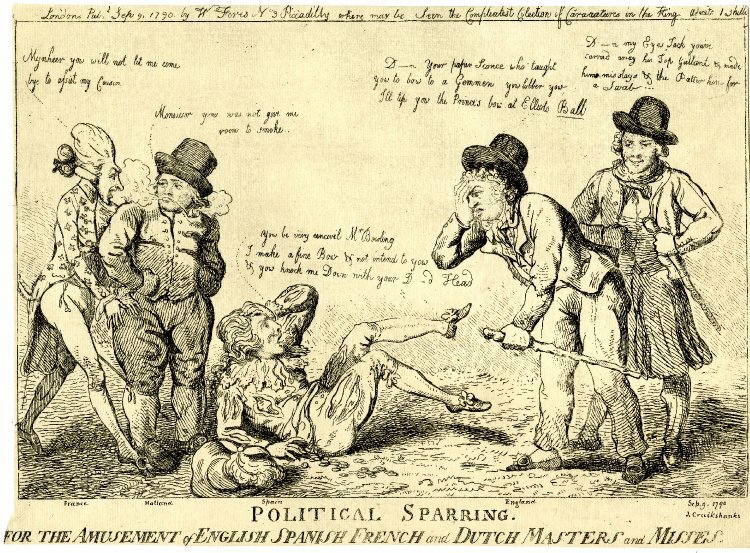 Political Sparring, Isaac Cruikshank, 1790, British Museum. A satire on the affair of Nootka Sound...England had appealed to her ally the United Provinces, who (with Prussia) had admitted that Spain was the aggressor and had promised support. Spain had retaliated with an appeal to France under the Family Compact. 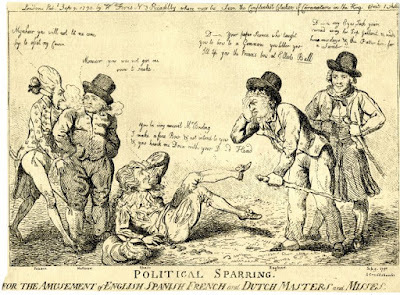 Cruikshank continues the political cartoon tradition of depicting Britain as a sailor: manful, strong, and violent. In this case, the sailor is referred to as "Mr. Bowling." 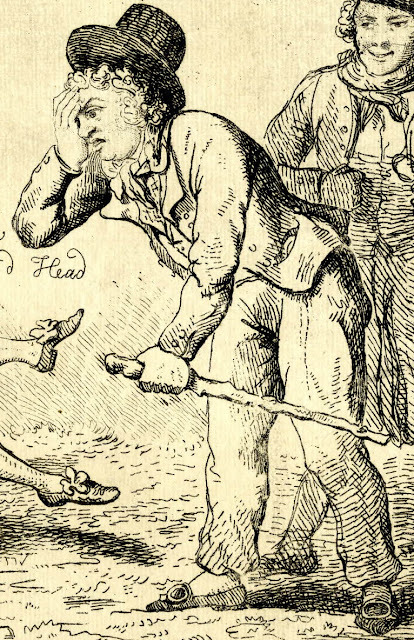 After the success of Tobias Smollet's 1748 novel The Adventures of Roderick Random, the name Jack Tar was joined by Tom Bowling as a shorthand for British sailors. Bowling clutches his forehead from where the Spaniard gave him a smack, but given the prostrate position of Spain, it looks as though Britain gave far more than he got. Bowling wears a round hat with upturned narrow brim and tall cylindrical crown. Around his neck he wears a plain neckcloth, tucked into a single breasted waistcoat. His jacket ends just below the waist, with slit pockets. Bowling's mariners cuffs are buttoned closed and loose plain trousers run down to the ankle, where he wears pointed toe shoes with round buckles. In his left hand is a stick. D-n my Eyes Jack, you've carried away his Top Gallant & made him mis stays & the Patter him for a Swab. The sentence is a mishmash of nautical terms being used in a way that doesn't make a lot of sense, but is mean to mimic the common speech of sailors that, to the average Briton, was just as nonsensical as this. Our sailors wears a round hat with a tall rounded crown and short upturned brim over what may be a bob wig. His plain neckcloth is wrapped around his neck like a scarf, draped over the collar of his single breasted jacket with its buttoned mariners cuffs. A single breasted waistcoat is short with a very narrow cutaway at the bottom, hanging over his petticoat trousers. As with Jack Bowling, this sailor carries a stick. Not a lot of nonsense in the speech of the shipmate, actually, just figurative speech. "carrying away [one's] topgallant" means to lose one of the uppermost sails (the topgallant is the third level of the mast: mast -> topmast -> topgallant mast), as could happen to a ship in a storm. "to miss stays" means for a ship to not manage a tack (when sailing against the wind, changing the direction of the ship by sailing through the eye of the wind), so the ship loses its speed and stops with flapping sails. In a squadron or in view of other ships, this was a very embarrassing situation. So in a nutshell, the shipmate is saying "you have damaged him and made him look stupid".